Photos from Presentation Night (with thanks to Ellen Downes for photography) are now available. Finals Night was held on 13th September at Abingdon United FC with some great matches including a massive game for the Red Drive 3s with Dave Hudson doing two 6s and Dave Dix following with 6-5. Pairs and Singles semi and finals will be played on Presentation Night 20th October 2017 at Abingdon United FC. Programmes on sale soon ! 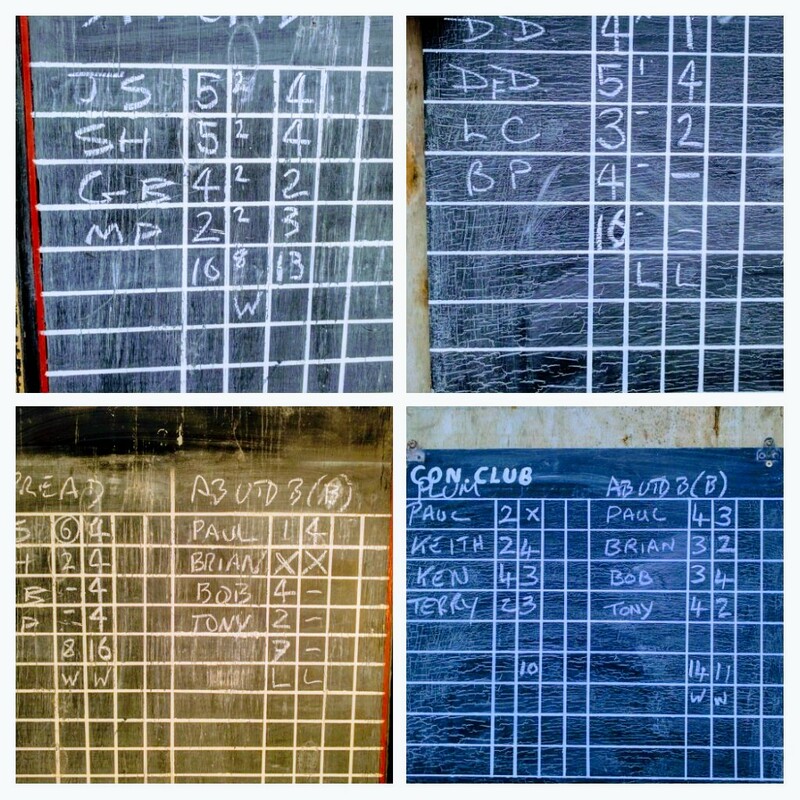 Competition News: A disappointing turnout in the Tom Simmons 5’s Knockout this week with two out of the six teams unable to field teams left only 3 contenders once Spread Eagle B withdrew after a pre-match issue with unsporting behaviour from a player from Spread Eagle. Spread Eagle B lodged a complaint with the Committee and the player’s team Captain/Secretary have been warned that any further behaviour will result in the player being barred from the League. The Committee will decide whether the other semi-final should be rescheduled. Plum Pudding took on the might of Abingdon Utd B in the Semi-Final to lose 2-0 to putting Utd through. 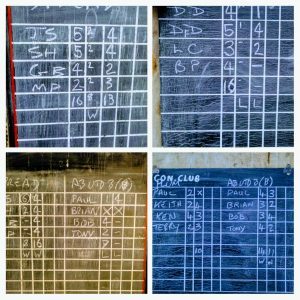 THIS WEEK : Singles competition – see fixture list for revised venues. No change to the Over 14s this week but Barry Parker (Ab Utd B) was unlucky with 4-5-4 and unfortunate not to retain his World Title at the Charlbury Beer Festival this year. Next time Barrington. 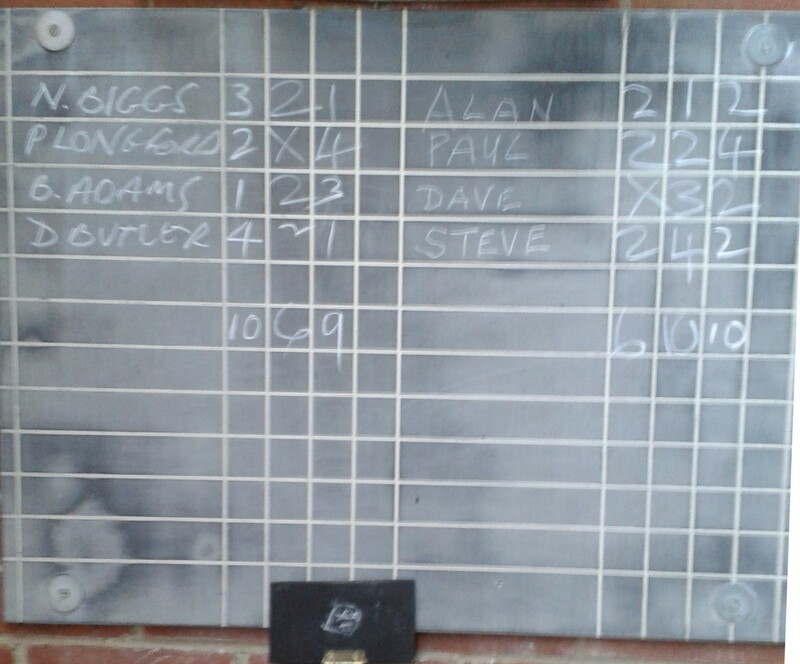 Competition News: Eights Final was played at Abingdon Conservative Club this week between Spread Eagle and Ab.Utd. B. Spread’s Scott Humphries had to retire injured which was crucial to Ab.Utd. securing the trophy for 2017 despite missing the top man Dave Dix. First leg drew and Spread secured it on 3 sticks then Utd took the next two legs. Spread 20-18-22 and Ab.Utd.B 20.24.23. THIS WEEK: – Tom Simmons (5s) trophy matches ALL PLAYED AT Abingdon Conservative Club. See revised competition fixture list online. 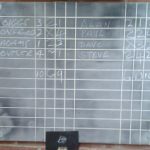 One match defaulted this week – no card entered for F Section North Star B vs RAL RecSoc. “Nil point”. Shame. A special mention to the newest team/pitch in the League – The Ladygrove A of Didcot. I’ve been asked to thank Chris Harrison and Darren ‘you know the rules’ Saunders for their efforts this week. Well done Dan Sheridan for making this happen and even getting the pitch sponsored! Magnificent! There’s a lady in the house for the over 14s in Janet Morton Waggon & Horses A – well done ! You’ve obviously vastly improved from your early season performance and/or got very fortunate with the knocks! Just shows anyone can put their mind to it. The Pairs Knockout was played at the Spread Eagle tonight with 20 pairs turning up for the competition with the best weather. With two pitches and a few preliminaries it took a while to get the games through with a finish around 11pm ! The B Section team Abingdon RBL (Capt D.Sapey) will be playing their games at Abingdon United FC for the rest of the season. Singles competition venue will also be changed in due course and will be notified nearer the time.